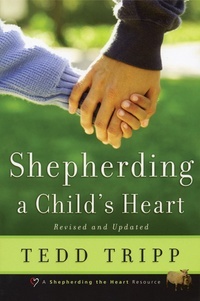 Shepherding a Child’s Heart is about how to speak to the heart of your child. The things your child does and says flows from the heart. Luke 6:45 puts it this way, “… out of the overflow of the heart the mouth speaks.” (NIV) Written for parents with children of any age, this insightful book provides perspectives and procedures for shepherding your child’s heart into the paths of life. —Dr. David Powlison, Professor of Practical Theology, Westminster Theological Seminary.